Your company should already have an accounts payable process in place, but does it run smoothly? By streamlining this process, you will not only keep up to date on all your bills and maintain good working relationships with your vendors—you can also save money, as many vendors offer an early payment discount for goods and services. According to the Institute of Financial Operations, over 42% of respondents to a survey about accounts payable automation captured less than 10% of early payment discounts. That’s a lot of lost savings. Keep on track and maybe save your company some money by developing and documenting a seamless accounts payable workflow chart with Lucidchart. What is the accounts payable process? Accounts payable, in simple terms, is the money that a company owes its creditors. “Creditor” can mean lenders, but most often it refers to vendors that provide a company the goods and services it needs to do business. Therefore, the accounts payable process is the process by which companies pay bills and invoices in an accurate and legitimate manner. Purchase order (PO): The document prepared by a company to delineate precisely what the company is ordering from a vendor. Receiving report: The company’s documentation of goods it has received from a vendor. Vendor invoice: The invoice or bill sent by the vendor for goods or services on credit. Three-way match: The technique used to ensure payment of vendor invoices is valid and accurate, comparing the purchase order, receiving report, and vendor invoice to see if they match. Voucher: A document used to approve payment, often used as a cover sheet for attaching the purchase order, receiving report, and vendor invoice after the three-way matching process. Vendor statement: Regular statement from a vendor listing the amounts remaining unpaid. Now that you’re familiar with the purpose and definition of accounts payable and some related terminology, you’re ready to build your accounts payable workflow. Download our accounts payable workflow template and follow along, and remember that, with Lucidchart, you can easily customize the template to better fit your business. Here we’ll go through the template from top to bottom, explaining the process as we go. From purchasing: Your purchasing department will provide purchase orders for goods ordered. From receiving: Your receiving department will provide receiving reports for goods received. From vendor: Vendors will provide invoices for the goods that have been ordered and received. Once the accounts payable department receives the purchase order, receiving report, and vendor invoice, they do a three-way match comparing the documents. If all documents agree, you’re ready to move on to the next part of the process and the next level on the flowchart. If the documents don’t agree, or if you have received a vendor invoice that does not have a matching PO or receiving report, some more research may be necessary to determine the validity of the invoice and whether it should be paid before the next part of the process. Once you have matched documents or determined the validity of a vendor invoice, you’re ready to prepare your vouchers. Gather all the documents—PO, receiving report, invoice, and any supplemental materials—and staple them together or put them in a folder with the voucher noting it is ready for payment. You’ll want to make two copies of the voucher, one for your accounting department for documentation and one for your treasurer or whomever makes the actual payments. To general accounting: This copy is filed for reference. In your workflow document, this stem ends here, but we’ll come back to it later. To treasurer or payer: This copy includes the purchase order, invoice, receiving report, and any other necessary documentation. The process on your workflow document follows from this point. As another check in the process, the treasurer or payer double-checks the documents to make sure everything matches. This step is especially important to prevent mistakes or fraud. The treasurer then prepares a check or other payment method. If the department pays by check, make a copy of the check to include in later filing. Once you have signed and mailed the check or processed the online payment, you have paid your invoice, completing the remittance phase. All that remains is filing for reference. Your workflow chart ends with an arrow back to the general accounting voucher entry from step three, as the treasurer sends back the voucher (marked paid), other documents, and a copy of the check or receipt from online payment for filing. 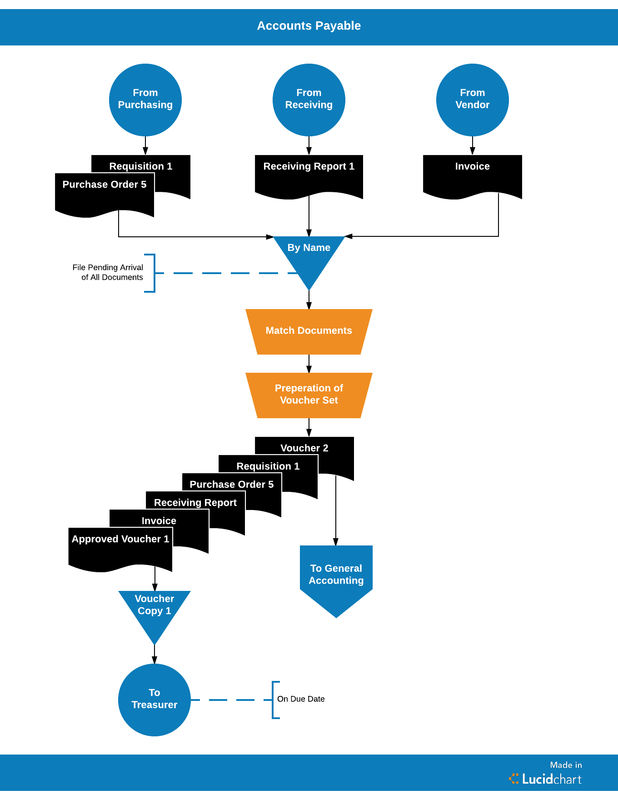 Now that you’ve gone through the process with our accounts payable workflow chart, you can get started customizing the process to fit your business. Is the person responsible for accounts payable also the one who signs the checks? Alter the template accordingly with ease. Does one person handle receiving and purchasing? Simplify the template up top. Sign up for free today to see all the ways you can take advantage of Lucidchart for documenting your processes.